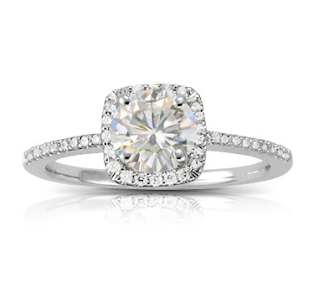 More and more, moissanite is becoming a popular choice for engagement rings and other special jewelry. Although a moissanite ring isn’t a diamond ring, it is as close as you can get, and nobody can tell the difference. If you are sweating the cost of an engagement ring, but you really want to impress your future fiancé, the following are some benefits of moissanite that you should understand. To get a large, high quality diamond that will really impress your girlfriend, you will be looking at some pretty high prices. If you choose to have a pink diamond in there, the cost will go up even more. At that point, you have some options for saving money. One thing you can do is to find a smaller diamond. You could look for one that is scored lower in terms of color and clarity. You could purchase a diamond with a larger flaw. Of course, none of that sounds very romantic, so you might want to look into lab diamonds. Moissanite is a type of lab created diamond that costs considerably less than a mined diamond of the same size, cut, color, and clarity. When you set a lab diamond next to a mined diamond, the lab diamond will be just as brilliant as the mined one. Most people cannot tell the difference between a moissanite diamond and a mined diamond because of the brilliance. Other types of fake diamonds, such as cubic zirconia and other synthetic types are easier to spot because they are not very brilliant. Moissanite is just as versatile as a real diamond when it comes to the shape. If you have already started shopping for rings, you may have noticed that diamonds can be round, marquise, princess, heart, oval, baguette, and other shapes. One of the advantages of choosing a moissanite diamond is that you can get the ring you want with the diamond shaped like you want it. The options for design, style, and shape are just the same as they are for mined diamonds. If you still have the romantic idea that you need to have real diamonds in the engagement set, consider a combination of moissanite and mined diamonds. You could use moissanite for the center stone, with diamonds surrounding the center stone, or even wrapped around the wedding band. Because their chemical and physical properties are the same, nobody will be able to tell the difference between the lab and the real diamonds. One thing to keep in mind before you buy a ring is to talk to your girlfriend about the choices you have. She might have an idea in mind already of what she wants her ring to look like. She might not be okay with the decision to have a lab diamond in her set, and you will need to explain to her the financial and other benefits of going this route. After she understands, she will probably be more willing to have a moissanite diamond, whether is it paired with mined diamonds or not. Talk to your girlfriend and start looking at rings from Moissanite.com today.